When people hear I'm a composer, they frequently ask (as with many people in my field), "What kind of music do you write?" Unfortunately, what I write defies easy description because few people are familiar enough to have a category for it. The way I legitimize my learning and teaching—as with any academic field—is by doing what I teach on as detailed and complex a level as possible, contributing to my field in the process. Because I am trained as a composer, in order to teach composition, I spend a lot of time composing and much of my work is experimental. The instruments and voices for which I compose may be considered for lack of a better term "classical." My earlier training focused entirely on acoustic music. It wasn't until I started my doctorate that I began to intentionally study electronic music. Much of what I compose now is electronic and involves computers, though it still may include instruments or voices. Electronic music falls into two broad categories: Electroacoustic music, and Electronica.1 Electronica includes all the popular and commercial genres: Electronic Dance Music, Techno, Ambient, Dubstep, etc. Electroacoustic music, on the other hand, is artsy, avant garde, harder to get next to, and associted with academic institutions. Can you guess which category my work falls into? The thing is, artists in both categories use a lot of the same software, and are somewhat aware of each others' work. We also share the same early history—one of experimentation, innovation, research and development. The course in Electronic Music History and Literature that I teach ends in the 1980s. 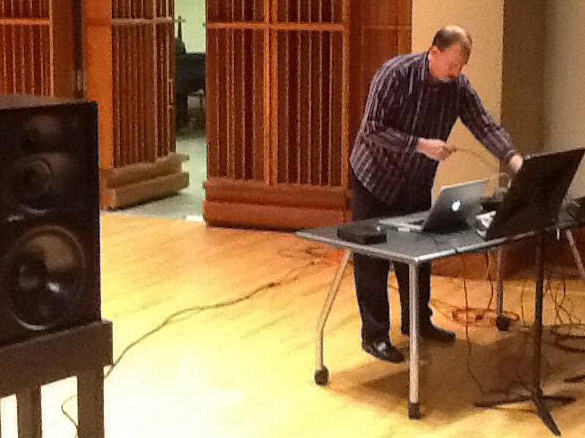 Examples of my work, both acoustic and electroacoustic can be found on the COMPOSITIONS page. 1Demers, Joanna, Listening Through the Noise: The Aesthetics of Experimental Electronic Music (New York: Oxford, 2010).